Helpers of the Holy Souls - From the Office of the Cardinal. His Eminence, Cardinal Sean O'Malley has asked me to acknowledge receipt of your letter of July 27, 2012 and to reply on his behalf. We appreciate your patience with this response and your understanding that there have been many commitments outside the Archdiocese in recent weeks. Thank you also for sharing information concerning various Catholic websites and noting [your] promotions for evangelization and prayers for the souls in Purgatory. 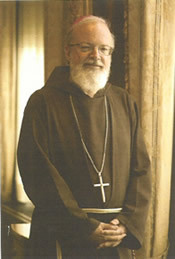 Thank you also for your daily prayers for Cardinal O'Malley, the priests of the Archdiocese and the good of the Church. Your prayers for vocations are greatly appreciated, may the Lord continue to bless our Church with dedicated young men seeking to discern the call to priesthood.